To place an order for Jr. Jack Attack equipment, please click on the button located above. Please be aware that excess postage fees may occur outside capital cities. Re-Delivery Fees will also be charged back to the club/school. 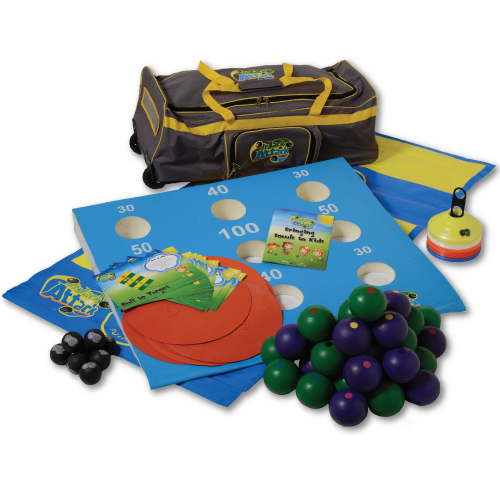 If you are purchasing Jr. Jack Attack equipment as part of Sporting Schools Funding, please ensure you have made a package booking through the Sporting Schools Portal in addition to purchasing here. For every two kits purchased in a transaction, a complimentry scoring wedge is included. Scoring wedge's are able to be purchased separately. Please note, your payment is NOT taken online. Your kit will be dispatched upon your order being received and your club or school will be invoiced for the purchase. Click here to visit our frequently asked questions for delivery time estimates. As a Club, if you require any further information, please contact Bowls Australia on 03 9480 7100 or email at admin@bowls.com.au. If you are part of the Bowls Australia Sporting Schools program you can contact Bowls Australia on 03 9480 7162 or email sportingschools@bowlsaustralia.com.au for any assistance.